French Easter (Pâques) traditions are fun and exciting, especially for children with the story of flying bells. It isn't surprising that these traditions revolve around French chocolate confectioneries (chocolat confiseries), French cuisine and the Church. Easter celebration is deeply rooted in the French culture. Its traditions reflect the country's ties to the Roman Catholic Church. Easter is a major holiday celebrated throughout France by practicing and non-practicing Catholics. One tradition in France is the April Fish. This is a prank that celebrates April Fool's Day by combining it with a splash of Easter since the latter holiday often occurs near this time of year. Since the fish is the ancient symbol for Christians, it's used in this unique April Fool's Day prank. Euroclub Schools describes how French children play this prank on adults. Traditionally children create paper fish they try to stick onto the backs of unsuspecting adults. The goal is to tag as many adults without them knowing it. If they dupe the adult, the child shouts out "Poisson d'Avril!" which means April Fish! This is similar to their American counterparts playing different types of pranks and shouting, "April Fool" when they dupe someone. However, April Fish isn't restricted to just children playing this April Fool's prank. Churches, with their soaring architecture and revered history, are an intrinsic part of the French culture. In fact, church bells typically ring out joyously at different times of the day. The bells are silenced beginning on Maundy Thursday before Good Friday. On Good Friday, no bells in France are rung in honor and remembrance of Jesus Christ being crucified and dying on the cross. It's believed that the story of the flying bells was created as a fun way to explain the absence of bell ringing to young children. Parents tell children that the bells sprouted wings and flew to visit the Pope in Rome for a blessing. Once there, the Pope presents the bells with delicious chocolate bells and eggs. On Easter morning, the bells fly home to France. One version of the story states the bells drop the chocolate treats in the backyards all over France for the Children to seek. These are easily seen and gathered. Another story version explains the bells hide the chocolates in nests the children leave out. Newer versions dovetail these traditions in the nest being left for the Easter Bunny to leave decorated eggs. This last version is a rather futile attempt to incorporate the Easter Bunny since it isn't a traditional character within the French Easter culture. On Easter morning, the church bells ring once more to rejoice in the resurrection of Jesus Christ. The children search for the cherished morsels the flying bells left in their homes, backyards and gardens. Some people combine this tradition with an Easter egg hunt. The Christian community celebrates by attending church and greeting friends and neighbors with Easter holiday greetings, such as "Joyeuses Pâques!" that translates in English as "Happy Easter!" Besides the ringing of the bells and chocolate treats, the French observe other Easter traditions with food. These family meals and celebrations take place on Easter Sunday and Easter Monday. 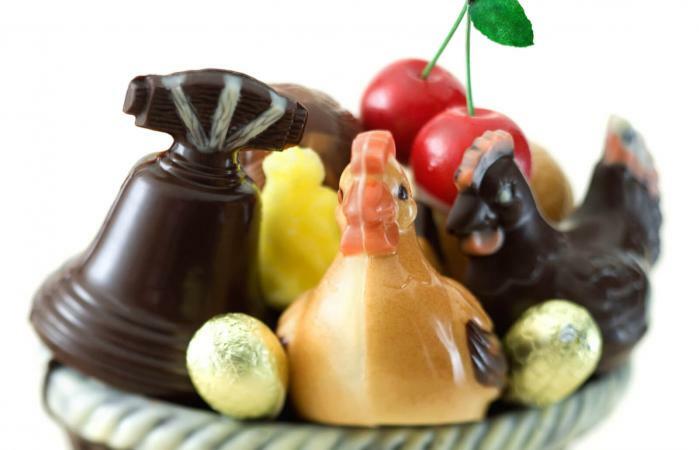 Throughout Lent and Easter, the magasins de confiseries (confectionery shops) or la chocolaterie (the chocolate factory) are usually filled with beautiful and delicious chocolates. In addition to bell and egg shapes, rich chocolate can also be found in the shape of bunnies, chickens and other animals. These intricately decorated chocolates are often exquisite works of art that are temptingly displayed in shop windows. The flying bells and April fish seem to be the two favorites. Elephant ears are a popular Easter pastry more commonly known as cinnamon palmiers (palm), but sometimes called pig's ear. This puff pastry is cooked to a crunchy consistency and is similar to that of a croissant. In most cultures, the family meal shared during a religious holiday is a time of appreciation and celebration of the family. The family bond is strengthened by the shared religious belief system. Easter Sunday dinner takes place after attending the Easter church service. The menu reflects the seasonal foods of the region. Leg of lamb: This is the most traditional meat cooked for the Easter Sunday meal. Another cut of lamb may be served or a rack of lamb. White beans: These are often served on a plate with slices of lamb placed on top of the beans and gravy poured over them. 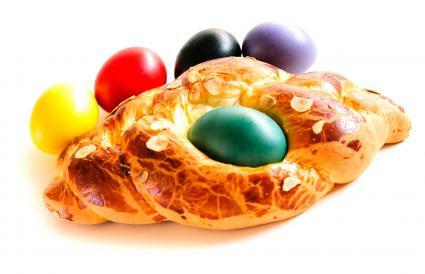 Easter brioche (la gâche de Pâques): This pastry bread is often made as a ring with a colored Easter egg placed in the center. Vegetables: Early spring vegetables are often served, such as roasted Brussels sprouts. Omelettes: Some families also serve an omelette. In addition to Easter egg hunts, there are two popular Easter games that use eggs. Both are played with fresh uncooked eggs. One popular Easter game in France that children enjoy is rolling fresh eggs down a gentle slope. The person whose egg makes it down the slope without breaking is the winner. It's believed this game was created to symbolize the stone that rolled away from the tomb where Jesus was entombed and on the third day rose from the dead. The second game is played by tossing uncooked eggs into the air. This game is simple since the children toss the raw eggs into the air and then catch them. This game progresses with continued egg tossing. The first child to drop and break an egg is the loser. In one version of the game, the losing child must give a portion of their candy to the other children. Organized Easter egg hunts are held in France as well as families having their own hunts in their backyards. Traditionally, these were hunts for hard-boiled eggs that were decorated for Easter, much like the traditional Easter egg hunts in America. However, Complete France explains that many French families have replaced or combined the traditional hard-boiled eggs with candy eggs and the hunt for chocolates left by the flying bells. Just outside Paris, one of the biggest Easter egg hunts is held on the ground of Chateaux Vaux le Vicomte. There are reportedly tens of thousands of eggs hidden, along with other family activities, such as face painting and pony rides! The day after the big celebration, many families spend the day recuperating, spending quiet moments together and enjoying the public holiday. The meals on this day are often a mix of leftovers like any other holiday. Traditionally, many families eat light on Easter Monday, such as cooking omelets for the family meal, enjoying a bowl of French onion soup, a rustic spring vegetable soup or lamb stew. Lots of fresh bread is always on the table along with the iconic cheeseboard. You can expect to find plenty of pastries and maybe a few chocolates hidden in a cupboard or underneath a leaf. On Easter Monday, one French town, Bessieres celebrates with a 15,000 egg omelet. This tradition honors the first colossal omelet ordered by Napoleon Bonaparte for his troops. The event draws over 10,000 participants and 40 cooks. Vignettes of French Easter traditions include delicious chocolate candies, magnificent churches, the ringing of bells, children giggling as they collect chocolates scattered across the lawn and scrumptious meals. These traditions reflect the family continuity and how traditional Easter celebrations are still a large part of the French culture.